Anyone trying to find out what policy options Keith Rowley would pursue if he were elected Prime Minister will most certainly run up against a blank wall. Is he for greater divestment of state enterprises as a means of citizenship empowerment? What is the balance between public and private sector involvement in the economy which his government will adopt? What would be Rowley’s new crime fighting strategies that will dramatically reduce crime? How will he improve the ailing health sector? How exactly will he prepare us for the customer focused, knowledge driven society of the future? How will he reduce our ballooning food import bill? What exactly would he do with children in situations of abuse and exploitation at home? These are merely some of questions which Keith Rowley has yet to answer to a GATE educated population. Clearly Rowley feels that he does not have to answer and that we will elect him in total absence of a policy framework for governing our country. Being thin on policy has always been his strategy. He was given the leadership of the PNM on a mantle without differentiating himself policy wise from his predecessor. He became political leader of the PNM solely by criticizing the Manning administration for corruption, arrogance and by being the baddest “raging bull” Rottweiler on the political block. How does his policy prescriptions differ from Manning’s? By very little; in fact by zero. We now know that by adopting wholesale Vision 2020 he has in fact co-opted Manning’s policies lock, stock and barrel. Is this laziness on Rowley’s part? Or is it that he cannot be bothered by the hard work of providing a framework for governing a complex, multi ethnic, inherently cynical, constantly evolving society burdened by escalating crime, a pervasive carnival mentality, and a PNM culture of near total dependency on the state. 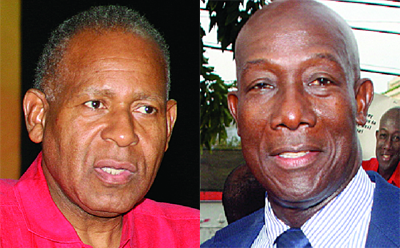 The only difference between Manning PNM, on the one hand, and Rowley PNM on the other; is a change in the leader. End of story. Can we then assume that the only difference between a Kamla Persad-Bissessar led government, and that run by a Keith Rowley will be merely a change in who leads. Will we be simply changing a woman who has matured immensely on the job of being Prime Minister for a man who is untested in the art of governance? That is why we are yet to hear any policy differences by Rowley on a range of issues from health, education, crime, food production, culture and any of the myriad of challenges facing us. His campaign, like that which led him to succeed as PNM leader, consists mainly of criticizing the UNC and Kamla Persad Bissessar in particular. We are yet to hear any policy prescriptions which differ from Kamla’s. With Eric Williams we knew it was Massa day done and control of the commanding heights of the economy. With Mandela it was dismantling apartheid. With Obama it was creating a more equal society. With the Tea Party it is seeking the interest of the rich in the hope that the wealth will trickle down. In England the conservatives adopt a pro-business, market driven, less government approach to government. With Rowley we simply do not know and perhaps will never know. We do not even know which parts of his “plagiarized” Vision 2020 document he will discard and which he will keep. Vision 2020 calls for reducing our food import bill by 10 per cent. Part of the strategy for achieving this goal will be the creation of large commercial farms like the 200 acre state owned farm at Tucker Valley in Chaguaramas. Is this still Rowley’s agricultural policy? Vision 2020 on page 119 talks without specifying about dealing with “children in situations of abuse and exploitation.” Will Rowley care to elaborate? Vision 2020 speaks about a target of US $37K annual per capita GNP by 2020. This according to the document “seems plausible since it requires an average growth of 9 per cent per annum to that year.” Given recent developments in global finance and the creation of green economy in 2015, is this still Rowley’s target? Maybe it is. Did The THA Really Win The MILSHIRV Matter?